This recipe offers a wonderful side dish (or breakfast, as I like to eat it) that is slightly sweet and spicy, and is a breeze to cook up. 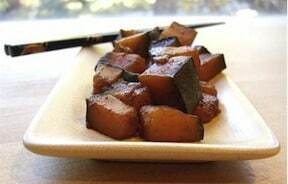 From start to finish, I had the kabocha ready in 20 minutes, and that was with minimal monitoring required. It was definitely a nice change from my usual roasting or steaming techniques with squash. Recipe and photo contributed by Alisa Fleming, from Alisa Cooks. Note: I have been devouring the entire batch within a day, but if you do put the leftovers in the refrigerator, the flavors seep in nicely and offer more of an infused flavor the next day. Feel free to enjoy it cold or warmed. Alisa Fleming is the author of Go Dairy Free. * Visit her web site, Go Dairy Free for a vast array of information and recipes.